Before I get on with this review, let's have a quick chat about social media. It's getting harder to avoid these days (not that I ever avoided it - I'm a Facebook addict). If you are so inclined, please follow Snack Love on Twitter and/or Facebook. 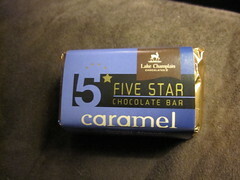 I purchased Lake Champlain Five Star Chocolate Bars at 3 for $5 at the local fancy grocery store. These bars are shaped unlike any other chocolate bar I've tried. They are small, but very thick. I cut the bar open first, and was amazed to see that it was almost entirely solid caramel. I was expecting a layer of caramel (like a Snickers bar), but instead, the majority of the bar was caramel with some nuts spaced throughout. I think the best way to describe this bar is to say that it's a mouthful. 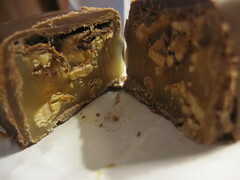 The caramel was very sweet and buttery, but it was very mild. Along with the almonds, I think there were chocolate chips in the caramel as well. While the bar was good and had a nice vanilla flavor, it was very rich and more caramel than I could handle (and I only had half of the bar). I wished I could taste the chocolate better, but this might be better suited for a die hard caramel fan. Looks interesting. I like the blockiness. It was too much for me with the caramel. Maybe it's just my memories of having braces.